In this playful State Fair of Texas engagement photo, the newly engaged couple hide their heads behind some giant cotton candy. Taken outside the historic art deco Hall of State, it's a fun way to announce your love for each other. Each Fall in Dallas, the State Fair comes to life at Fair Park, bringing with it live entertainment, food and family fun. It's a festive location to take engagement pictures whether you're acting playful on the midway or enjoying a Fletcher hotdog. The colors, sights, and sounds offer a treasure trove of backgrounds unlike anywhere else in DFW. 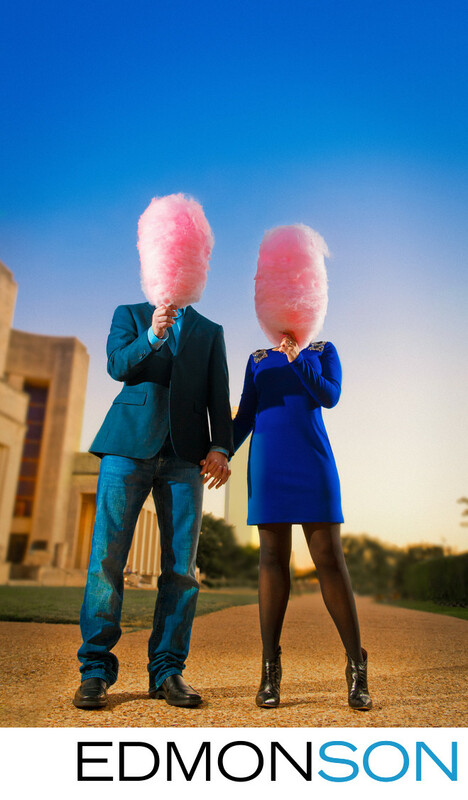 After shooting a variety of different portraits around Fair Park, the couple grabbed a couple massive pink cotton candies to hold in front of their heads. The facade of the Hall of State (another popular wedding venue) can be seen in the background as another gorgeous Texas sunset is beginning in the distance. This picture won several awards including Best Engagement Photo in the Portrait Division from Wedding & Portrait Photographers International (WPPI) in their annual 8x10 print competition. To achieve this look, two Nikon flashes were fired off-camera to achieve the rim lighting effect. DFW Events provided full-service wedding coordination. The State Fair of Texas is located at 3921 Martin Luther King Jr Blvd, Dallas, TX 75210 and the latest information is found on their website BigTex.com. This specific location is outside of The Hall of State At Fair Park which is available for rental for both photography shoots and weddings. Location: State Fair of Texas. 1/80; f/5.0; ISO 400; 32.0 mm.